NASA once considered putting tanks of liquid oxygen and hydrogen in the cargo bay. In January 1986, astronaut Rick Hauck approached his STS-61F crew four months before their mission was scheduled to launch. The shuttle Challenger was set to deploy the Ulysses solar probe on a trajectory to Jupiter, utilizing a liquid-fueled Centaur G-Prime stage. While an upcoming launch should be an exciting time for any astronaut, Hauck's was anything but optimistic. As he spoke to his crew, his tone was grave. He couldn't recall the exact quote in a 2003 Johnson Space Center (JSC) oral history, but the message remained clear. Hauck wasn’t just spooked by the lax approach that eventually led to the Challenger explosion. Layered on top of that concern was the planned method of sending Ulysses away from Earth. The Centaur was fueled by a combustible mix of liquid hydrogen and oxygen, and it would be carried to orbit inside the shuttle’s payload bay. Hauck's words may have seemed shocking, but they were prescient. In the early 1980s, the space shuttle seemed unstoppable. Technically called the US Space Transportation System program, the shuttle was on the verge of entering what was being called its “Golden Age” in 1984. The idea of disaster seemed remote. As experience with the craft grew, nothing seemed to have gone wrong (at least nothing the public was aware of). It seemed nothing could go wrong. In 1985, the program enjoyed a record nine successful spaceflights, and NASA was expected to launch a staggering 15 missions in 1986. The manifest for 1986 was beyond ambitious, including but not limited to a Department of Defense mission into a polar orbit from Vandenberg Air Force Base, the deployment of the Hubble telescope to low Earth orbit, and the delivery of two craft destined for deep space: Galileo and Ulysses. To meet strict deadlines, however, safety was starting to slide. Following the last test flight (STS-4, completed in July 1982), crews no longer wore pressure suits during launch and reentry, making shuttle flights look as “routine” as airplane rides. The shuttle had no ejection capability at the time, so its occupants were committed to the launch through the bitter end. Yet by mid-1985, the space shuttle program had already experienced several near-disasters. Critics of the program had long fretted over the design of the system, which boasted two segmented solid rocket boosters and an external tank. The boosters were already noted to have experienced “blow by” in the O-rings of their joints, which could leak hot exhaust out the sides of the structure. It was an issue that would later come to the forefront in a horrific display during the Challenger disaster. All of those risks existed when the shuttle was simply carrying an inert cargo to orbit. Shuttle-Centaur, the high-energy solution intended to propel Galileo and Ulysses into space, was anything but inert. 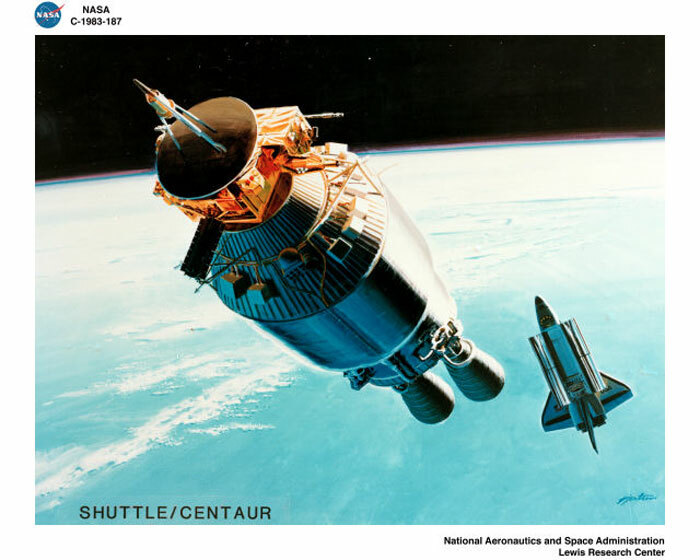 Shuttle-Centaur was born from a desire to send heavier payloads on a direct trajectory to deep space targets from America's flagship space vehicles. The Centaur rocket was older than NASA itself. According to a 2012 NASA History article, the US Air Force teamed up with General Dynamics/Astronautics Corp. to develop a rocket stage that could be carried to orbit and then ignite to propel heavier loads into space. In 1958 the proposal was accepted by the government's Advanced Research Products Agency, and the upper stage that would become Centaur began its development. The first successful flight of a Centaur (married to an Atlas booster) was made on November 27, 1963. While the launch vehicle carried no payload, it did demonstrate that a liquid hydrogen/liquid oxygen upper stage worked. In the years since, the Centaur has helped propel a wide variety of spacecraft to deep-space destinations. Both Voyagers 1 and 2 received a much-needed boost from their Centaur stages en route to the Solar System's outer planets and beyond. General Dynamics was tasked with adapting the rocket stage so it could be taken to orbit on the shuttle. A Convair/General Dynamics poster from this period read enthusiastically, “In 1986, we're going to Jupiter...and we need your help.” The artwork on the poster appeared retro-futuristic, boasting a spacecraft propelled by a silvery rocket stage that looked like something out of a sci-fi fantasy novel or Omni magazine. In the distance, a space shuttle—payload bay doors open—hovered over an exquisite Earth-scape. 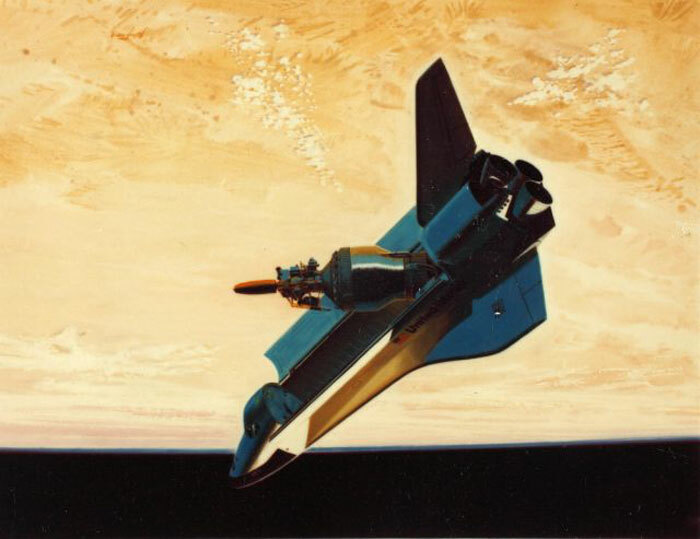 General Dynamics' artistic rendering of Shuttle-Centaur, with optimistic text about a 1986 target date for launch. However, the Centaur aboard the shuttle also had its drawbacks. First, it required changes in the way the shuttle operated. A crew needed to be reduced in size to four in order to fit a heavier payload and a precipitously thin-skinned, liquid-fueled rocket stage inside a space shuttle's payload bay. And the added weight meant that the shuttle could only be sent to its lowest possible orbit. In addition, during launch, the space shuttles' main engines (SSMEs) would be taxed unlike any other time in program history. Even with smaller crews and a food-prep galley removed mid-deck, the shuttle’s main engines would have to be throttled up to an unheard-of 109-percent thrust level to deliver the shuttle, payload, and its crew to orbit. The previous “maximum” had been 104 percent. While a host of unknowns remained concerning launching a volatile, liquid-fueled rocket stage on the back of a space shuttle armed with a liquid-filled tank and two solid rocket boosters, NASA and its contractors galloped full speed toward a May 1986 launch deadline for both spacecraft. The project would be helmed by NASA's Lewis. It was decided that the orbiters Challenger and Discovery would be modified to carry Centaur (the then-new orbiter Atlantis was delivered with Centaur capability) with launch pad modifications taking place at the Kennedy Space Center and Vandenberg. The launch plan was dramatic: two shuttles, Challenger and Atlantis, were to be on Pads 39B and 39A in mid-1986, carrying Ulysses and Galileo, each linked to the Shuttle-Centaur. The turnaround was also to be especially quick: these launches would take place within five days of one another. The commander of the first shuttle mission, John Young, was known for his laconic sense of humor. He began to refer to missions 61F (Ulysses) and 61G (Galileo) as the “Death Star” missions. He wasn't entirely joking. The thin-skinned Centaur posed a host of risks to the crews. In an AmericaSpace article, space historian Ben Evans pointed out that gaseous hydrogen would periodically have to be “bled off” to keep its tank within pressure limits. However, if too much hydrogen was vented, the payloads would not have enough fuel to make their treks to Jupiter. Time was of the essence, and the crews would be under considerable stress. Their first deployment opportunities would occur a mere seven hours post-launch, and three deployment “windows” were scheduled. The venting itself posed its own problems. There was a concern about the position of the stage's vents, which were located near the exhaust ports for the shuttles' Auxiliary Power Units—close enough that some worried venting could cause an explosion. 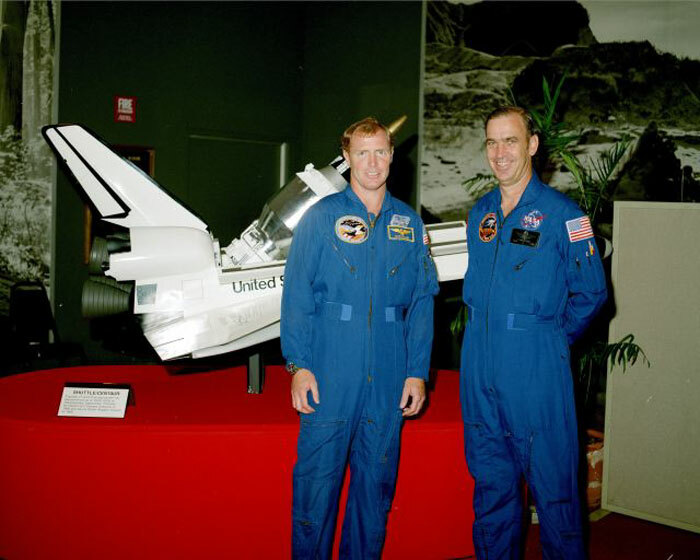 Astronauts John Fabian and Dave Walker pose in front of what almost became their “ride” during a Shuttle-Centaur rollout ceremony in mid-1985. Within weeks, the potential crisis was derailed dramatically by an actual crisis, one that was etched all over the skies of central Florida on an uncharacteristically cold morning. On January 28, 1986, Challenger—meant to hoist Hauck, his crew, Ulysses, and its Shuttle-Centaur in May—was destroyed shortly after its launch, its crew of seven a total loss. On that ill-fated mission, safety had been dangerously compromised, with the shuttle launching following a brutal cold snap that made the boosters' o-rings inflexible and primed to fail. It became clear NASA had to develop a different attitude toward risk management. Keeping risks as low as possible meant putting Shuttle-Centaur on the chopping block. In June 1986, a Los Angeles Times article announced the death-blow to the Death Star. 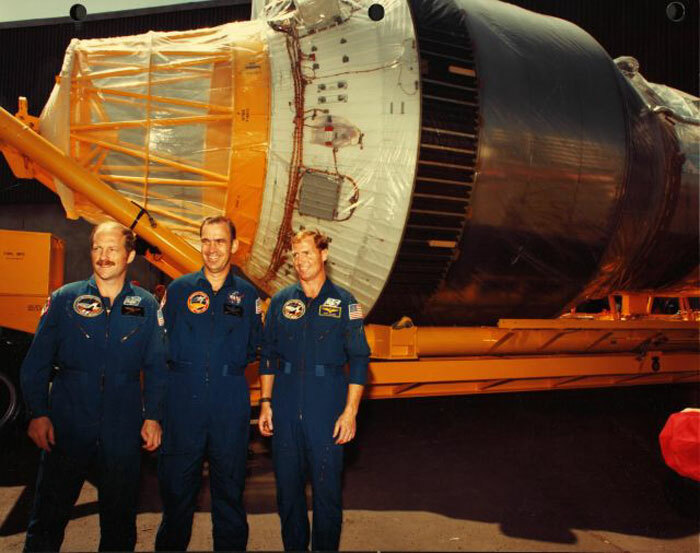 Astronauts Rick Hauck, John Fabian, and Dave Walker pose by a Shuttle-Centaur stage in mid-1985 during a rollout ceremony. Hauck and Fabian both had misgivings about Shuttle-Centaur. After a long investigation and many ensuing changes, the space shuttle made its return to flight with STS-26 (helmed by Hauck) in September 1988. Discovery and the rest of the fleet boasted redesigned solid rocket boosters with added redundancy. In addition, crews had a “bailout” option if something went wrong during launch, and they wore pressure suits during ascent and reentry for the first time since 1982. Galileo was successfully deployed from Atlantis (STS-34) using an IUS in October 1989, while Ulysses utilized an IUS and PAM-S (Payload Assist Module) to begin its journey following its deployment from Discovery (STS-41) in October 1990. As for Shuttle-Centaur? Relegated to the history books as a “what if,” a model now exists at the US Space and Rocket Center in Huntsville, Alabama. It still looks every inch the shiny, sci-fi dream depicted in posters and artists' renderings back in the 1980s. However, this “Death Star” remains on terra firma, representing what Jim Banke described as the “naive arrogance” of the space shuttle's Golden Age. Hitt, D., & Smith, H. (2014). Bold they rise: The space shuttle early years, 1972 – 1986. Lincoln, NE: University of Nebraska Press. Jenkins, D. R. (2012). Space shuttle: The history of the national space transportation system, the first 100 missions. Cape Canaveral, FL: Published by author. Turnill, R. (Ed.). (1986). Jane's spaceflight directory (2nd ed.). London, England: Jane's Publishing Company Limited. Young, J. W., & Hansen, J. R. (2012). Forever young: A life of adventure in air and space. Gainesville, FL: University Press of Florida. Dawson, V., & Bowles, M.D. (2004). Taming liquid hydrogen: The Centaur upper stage rocket, 1958 – 2002. Washington, D.C.: National Aeronautics and Space Administration.